Pizza for Good is an inspiring and wildly entertaining cookbook, memoir, and philanthropic guide to building local community through food. Will Pollock, the founder of the charitable artists' collaborative ARTvision and an Atlanta-based writer, has created 20 unique recipes for specialty pizzas that emphasize locally sourced ingredients and come with a buffet of helpful kitchen tips. 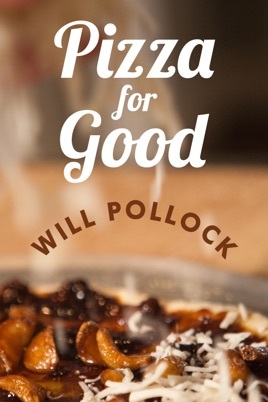 But Pizza for Good is also a funny, moving, and thought-provoking series of stories about Pollock's personal experience in creating a philanthropic arts organization and his community-building efforts as achieved through pizza. His aim is to not only give readers brand new ways to think about their favorite food, but to offer straightforward advice on how they can start their own "Pizza for Good" events for the causes that mean the most to them. For over ten years, Pollock has hosted a "Gourmet Pizza Extravaganza," which started as a small gathering of hungry revelers and eventually grew into an annual tradition sparking a local movement that has raised over $40,000 to date for Positive Impact, an Atlanta-based organization helping those affected by HIV and AIDS. Pizza for Good, half the proceeds of which will go to HIV and LGBT/human rights charities, chronicles this event's progression and works as a how-to guide for eager cooks, community activists, and charitable-minded do-gooders. Featuring an innovative level of interactivity between readers and author, Pizza for Good links directly to Pollock's blog to continue the conversation online and bring the book's message of community-building into the 21st century. Embedded video and music as well as digital resources that are just a touch away make Pizza for Good a completely one-of-a-kind reader experience that will change the way you think about America's favorite food.